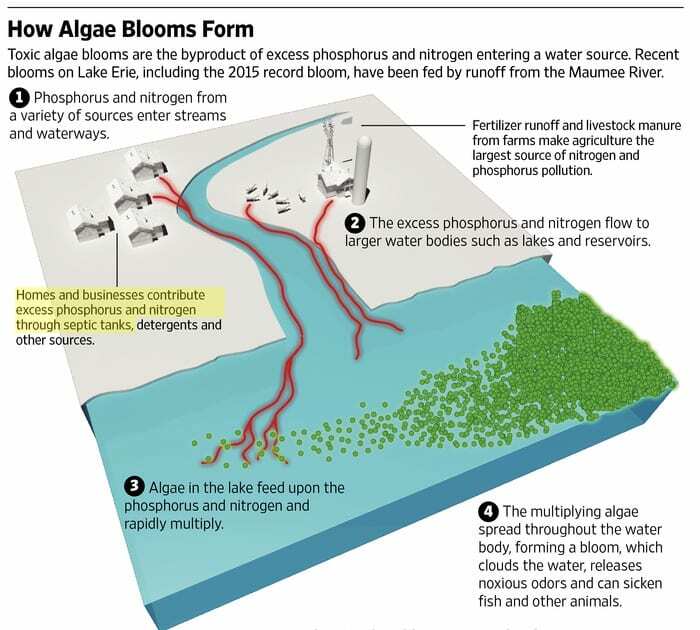 According to a June 2016 Wall Street Journal article a growing list of states ramping up efforts to control potentially toxic algal blooms that are fouling water supplies and making summer swims dangerous in lakes, ponds and reservoirs. Microbiologists say … growing population and changing land use practices are culprits in the rise. The algae blooms have hurt real-estate values in his lake-front community and businesses. Joe Cornely, a spokesman for the Ohio Farm Bureau Federation, said the group is cautiously supportive of the state’s plan, which also seeks to address … bad septic systems. (Notice above how the algae bloom is most pronounced near a population of septic systems. In another example in 2015 an algal bloom stretched for 500 miles along the Ohio River, the biggest ever. Wisconsin has set the most stringent maximum limits for phosphorus in rivers, lakes and reservoirs. Last month, roughly 60 local governments around Madison agreed to pool $2 million annually for the next 20 years to pay for measures to keep phosphorus out of rivers. Iowa lawmakers sought ways this spring to curb nitrates and phosphorus but failed to pass any measures. The state was forced to close beaches at parks in record numbers last summer because of algal blooms that can make swimmers and even dogs sick when they ingest the water, and that irritate the skin after swimming. A Des Moines water utility has also sued three counties over high nitrate levels in a potentially precedent-setting case that seeks to hold local governments accountable for drainage issues. The EPA is planning to introduce a mobile app to alert people about potentially dangerous blooms in their areas. “Things are getting worse,” said Raphael Kudela, a phytoplankton ecologist at the University of Southern California. He noted that last summer an algal bloom off the West Coast, stretching from central California to Alaska, was the area’s most severe on record. 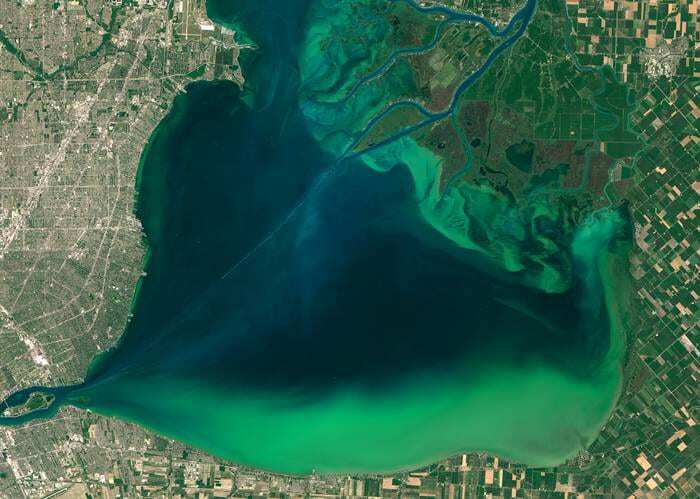 In recent years, warmer temperatures have increased the time algae can grow and more intense storms have caused more phosphorus and other nutrients to be washed off urban and agricultural lands, according to the federal EPA. Shallow area of lakes are warm which encourages algae proliferate.